More than 70 German women, nine of whom are schoolgirls, have left their home country for Syria and Iraq to join the Islamic State, the president of the German Domestic Intelligence Service (BFV) said. According to Hans-Georg Maassen, 40 percent of those women are under the age of 25, Zeit Online reported. 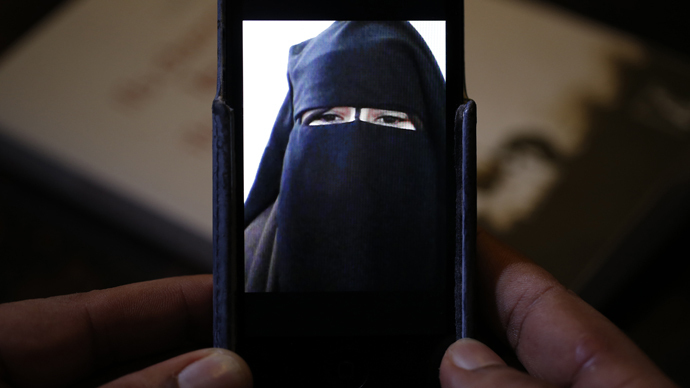 While the recruitment of young girls and women by the Islamic State is not a rare phenomenon, Maassen warned that jihadists have lately focused on luring females to join the 'caliphate' via social networks. Jihadists blog on the internet and are active on forums, where they look for women showing an interest in jihad, BFV’s president said. Islamic State (IS, formerly ISIS/ISIL) militants then contact the girls and women to inspire them to marry jihadists. Maassen says they write blogs with “romantic descriptions” of life in extremist camps, and the females have no idea about the future they are actually agreeing to. Most often, those who travel to be with jihadists are completely isolated, their passport and phones taken away. According to Islamic scholar Marwan Abou-Taam, who works for the Rhineland-Palatinate state police in Germany, women attracted by such scenarios have psychological problems or feelings of social exclusion, Zeit Online reported. They often come from extremely poor families and have low levels of education. Meanwhile, the expert says there are still a few young women among them with higher levels of education, adding that ISIS may consider giving them “management” roles. Security services currently have no information on whether European women are intended to be used by the jihadists as suicide terrorists, but say they cannot exclude the possibility. The German Domestic Intelligence Service says the overall number of those who have left the country to fight in Syria and Iraq on the side of the jihadists is around 650 people. Earlier in March, German Interior Minister Thomas de Mazière said around 200 of them had returned home. Actions have already been taken against some of the returnees, while others remain under strict surveillance. The Syrian Observatory for Human Rights earlier this month reported that ISIS has intensified the recruitment of children and teenagers this year, since facing difficulties in attracting adults into their troops. At least 400 children from Syria alone were recruited by ISIS over the past three months.